Many neurodegenerative diseases spread by hijacking the brain's connective circuitry to transport toxic proteins, which gradually accumulate and trigger symptoms of dementias. 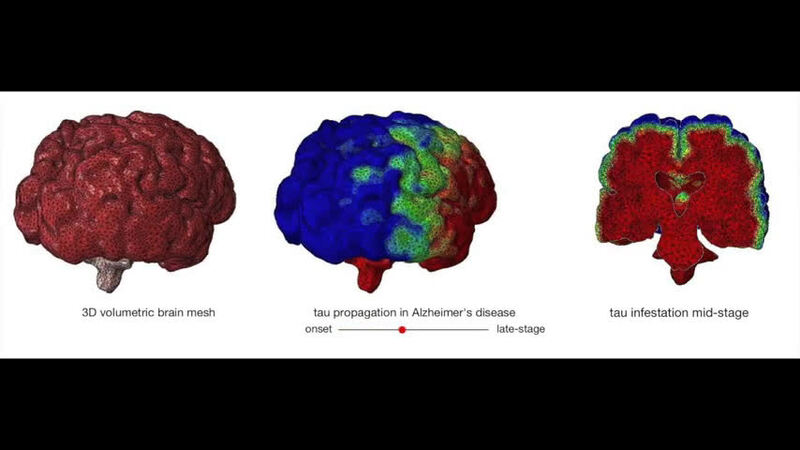 Now, researchers at Stevens Institute of Technology and colleagues have modeled how these toxic proteins spread throughout the brain to reproduce the telltale patterns of atrophy associated with Alzheimer's disease, Parkinson's disease, and amyotrophic lateral sclerosis, or ALS. The work, to be published in the Oct. 12 issue of Physical Review Letters, could open a new frontier in computer brain modeling, as it highlights a first step toward bridging micro and macro approaches—from the interaction of individual molecules to medical image analysis of the entire brain. It can also expand the fundamental understanding of these diseases, which is estimated to affect more than 12 million Americans within the next 30 years if left unchecked. "This is a first attempt to bridge scales between the cellular level and the whole-organ level," says lead author Johannes Weickenmeier, a professor of mechanical engineering at Stevens. "The key is to couple biochemistry to the biomechanics of the brain to better understand the dynamics of these diseases." As a postdoctoral researcher, Weickenmeier pioneered a technique for building a digital brain by using 3-D modeling software to arrange more than 400,000 pyramid-shaped virtual blocks, reconstructing block by block the highly folded and curved structure. "It's an art form," says Weickenmeier. "To reconstruct all those individual folds is pretty difficult." He then overlaid his model with data gleaned from diffusion tensor imaging, which reveals the directions of signals passing through the brain. Some brain structures carry signals predominantly in specific directions, so the digital model captures not just the brain's anatomical features, but also the way electrochemical signals flow through them. To model the spread of toxic proteins through the brain, Weickenmeier and his team, including colleagues Ellen Kuhl from Stanford and Alain Goriely from Oxford, used equations similar to those that describe how heat diffuses through materials. They found that while different neurodegenerative diseases often involve very different biochemistry—and produce very different symptoms—the model could reproduce the telltale patterns of atrophy associated with Alzheimer's disease, Parkinson's disease, and other neurodegenerative diseases, simply by changing the toxic proteins' starting points in the brain. "These patterns of atrophy emerged inherently from our system," Weickenmeier says. Toxic proteins are "seeded" in different places for different diseases, Weickenmeier explains, and their spread across the brain—and therefore the symptoms they produce—is dictated by the connective pathways available to them. 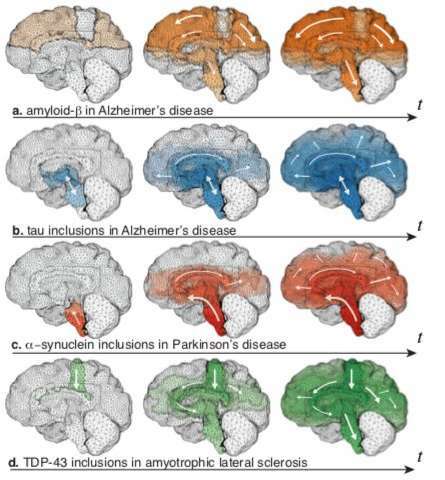 Biochemistry still matters, but the simulation's efficacy suggests that neuroanatomy and connectivity also play key roles in mediating the progression of neurodegenerative diseases. More refined simulations could one day speed diagnosis by predicting symptoms, or help researchers develop new treatments. However, digital brain modeling is in its early stages, partly because there is relatively little data against which to judge the model's predictions. At the same time, brain imaging techniques that can visualize these diseases are being actively developed by the neuroimaging community. "Once we have those, we'll be able to calibrate our models to make accurate patient-specific predictions in the future," says Weickenmeier. The model's potential extends to other diseases as well. Similar mechanisms underpin multiple sclerosis, as well as chronic traumatic encephalopathy, or CTE, a disease that likely affects people exposed to repeated head impact, from cheerleaders to football players. "These medically relevant diseases, such as Alzheimer's disease and other neurodegenerative diseases are the motivation for our 'in silico' models," says Weickenmeier. "They allow us to strategically run different simulations to test individual hypotheses of disease progression and see which new approaches seem promising."